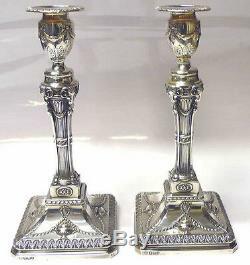 Victorian Silver Candlesticks Made by HAWKESWORTH EYRE & CO c. Please scroll down for photographs below. An attractive pair of antique sterling silver candlesticks with shaped reeded columns standing on splayed square bases with canted corners. The sticks are decorated with classical motifs such as rams heads, urns, rope twists and garlands. Please note that this item is not new and will show moderate signs of wear commensurate with age. Reflections in the photograph may detract from the true representation of these items. Waxantiques is an accredited member of LAPADA, the Association of Art & Antiques Dealers, and CINOA, the International Confederation of Art Dealers. All members have to meet stringent requirements as to experience, quality of stock and knowledge of their subject. Please make all cheques payable to "Wax Antiques". Posting days are Wednesday and Friday. North America, Australia and Japan: FREE. Rest of the world: Price on request. The item "Victorian Silver Candlesticks 1894 Hawkesworth & Eyre stock id 7008" is in sale since Wednesday, October 12, 2016. This item is in the category "Antiques\Silver\Solid Silver\Candlesticks/Candelabra". The seller is "waxantiques" and is located in London. This item can be shipped worldwide.